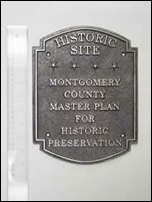 Architecturally or historically significant sites may be designated on Montgomery County’s Master Plan for Historic Preservation. Historic designation qualifies properties for certain protections under the Historic Preservation Ordinance and may make property owners eligible for various financial incentives for qualified rehabilitation and/or maintenance projects. In 1976, the Maryland-National Capital Park and Planning Commission (M-NCPPC) created the Locational Atlas & Index of Historic Sites, which identifies resources that are potentially historic. Resources listed on the Atlas are protected from demolition or “substantial alteration” under Chapter 24A [PDF] of the County Code. In 1979, the County Council adopted the Master Plan for Historic Preservation and the Historic Preservation Ordinance (Chapter 24A). The Master Plan for Historic Preservation is the County’s preservation planning document. It includes the list of all officially designated historic sites and districts. Sites and districts which have been added to the Master Plan have been found to be of special historic or architectural significance and merit protection under the Historic Preservation Ordinance. Use this interactive mapping tool to determine whether a property is identified in the Locational Atlas or designated in the Master Plan. The evaluation begins with a completed research form. The HPC then holds a public hearing to review each resource and evaluate its eligibility for designation. The HPC then transmits their recommendations to the Planning Board for consideration of the Public Hearing Draft Amendment to the Master Plan for Historic Preservation. The Planning Board holds a public hearing on the Public Hearing Draft. After the hearing, the Board conducts a work-session to review the HPC recommendations, the public hearing testimony, and the historic preservation planning staff’s recommendations. The Board then formulates its own recommendations, known as the Planning Board Draft Amendment. The Planning Board Draft is transmitted to the County Council for review. In addition, the County Executive has the opportunity to provide comments on the amendment. The County Council holds a public hearing and work-sessions and approves, or disapproves, or amends the Planning Board Draft. The Planning Board Draft is then forwarded to M-NCPPC to become an Approved and Adopted Amendment to the Master Plan for Historic Preservation. The steps in this evaluative process are measured, careful, open and transparent. Citizens have numerous opportunities to make their views known to the reviewing bodies. The Historic Preservation Commission, Planning Board, and County Council, each in turn, publically evaluate whether or not they believe a resource meets the criteria for designation, and at each step of the process property owners and interested parties have an opportunity to provide comments in writing or in person.